This is a copy of a review of Dirty Entanglements: Corruption, Crime, and Terrorism, by Louise I. Shelley (New York: Cambridge University Press, 2014), published in Contemporary Sociology, March 2016. Please cite as: Deflem, Mathieu. 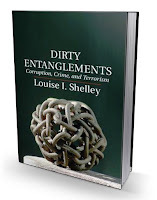 2016. Review of Dirty Entanglements: Corruption, Crime, and Terrorism, by Louise I. Shelley. Contemporary Sociology 45(2):242-244. It is too obvious to mention why terrorism has in recent years moved to the foreground of attention in the social sciences, including those disciplines, such as sociology, where terrorism was historically not a central concern. Much work has now been done to uncover the social dimensions of terrorism, and the area of terrorism will surely continue to provide a rich field of study for many years to come. In this interesting book, public policy scholar Louise Shelley tackles a specific aspect of contemporary terrorism by exploring the nexus between terrorism, crime, and corruption. While each of these problems have been the subject of much intellectual reflection, it is the special merit of this book that the author focuses on the connections that exist between them. Shelley situates the topic of her research in the background of ongoing developments of globalization and the changing nature of international terrorism over the past decades. The ‘new’ terrorism that has arisen is more organized than ever before and has consequences that are at once economic, political, and social in multiple other respects. As globalized commerce has ever more connected geographically dispersed parts of the world, the victimization from terrorist attacks extends to the citizens and governments of many countries. In this increasingly globalized setting, the connections of terrorist activities with (other) crimes and with corruption are critical for a useful understanding of the contemporary problem of terrorism. Shelley relies on the notion of ‘entanglement’ to chart these shifting connections in the contemporary world. The book adopts a case-study approach that, aided by the author’s considerable linguistic skills, extends to a wide range of countries across the world. Methodologically, the analysis relies on a variety of data, including official sources and interviews with counterterrorism professionals. Rather than getting entangled in pointless discussions on a singular definition of terms, Shelley adopts a constructive approach to focus on the activities and financing of terrorist groups. The focus on the nexus with crime and corruption is justified as terrorism is consistently connected with these other illicit activities. The primary criminological focus is on organized crime that is international in nature, while corruption involves the abuse of power for financial as well as nonmonetary gain. The author’s analysis is presented in eight chapters divided over two parts. Part I of the book explains the framework of analysis and the logic that underlies the terrorism-crime-corruption connection. Beginning with illustratively untangling the relevant dynamics of certain high-profile cases, such as the 9/11 attacks and the Beslan school massacre, Shelley demonstrates that crimes (other than terrorism itself) and corrupt actions have been instrumental in supporting a whole range of international terrorist activities in the present century even when the ideologies behind these terrorist acts are decidedly different. Additionally, corruption sustains both terrorism and organized crime, in part facilitated by certain state policies that enable the activities of illicit non-state actors in engaging in terrorist recruitment and operations. As levels of corruption increase, citizens in affected countries face strains towards support for and participation in the activities of terrorist groups, additionally enticed by the services they provide in matters of health, housing and other basic needs. Shelley also debunks the notion that all terrorism is ideological while all other crimes would be profit-driven as the connections between terrorism and other criminality is now so intertwined that divergent motives can co-exist and become entangled. The problem is also not one that only affects weak and thus corruption-prone states as many areas across the globe are seen to be affected. The support structure for terrorism today is multi-layered and global. In Part II of this book, Shelley focuses in a more in-depth manner on the businesses of terrorism by examining the three case studies of drugs, underpoliced crimes, and weapons of mass destruction. The conception of terrorism as business is justified by the fact that profitable criminal activity has become a preferred instrument in the whole of terrorist activities. Thus, terrorist organizations are savvy in matters concerning tax evasion, market trends, cost-benefit analysis, opportunity targets, technological innovations, and other economic strategies that mimic legal business ventures. Human capital and laundered money are among the assets that are pursued. Turning to the case studies, the trade in illicit drugs is the most commonly used method to fund terrorist groups. The drug trade is not only very profitable but also distinctly global in reach. Other criminal activities, such as art smuggling and the sale of counterfeit products, are favored inasmuch as they are less policed. And, finally, some terrorist organizations are involved in pursuing weapons of mass destruction, including nuclear and chemical weapons. The negative consequences should such endeavors become successful are obvious. The problem of nuclear and chemical terrorism is additionally heightened by the fact that educated professionals of different nations are often involved in these operations in highly sophisticated ways. In conclusion, author Shelley suggests that policymakers should focus on the uncovered connections between terrorism, crime, and corruption, rather than approach each problem separately. The entire economics of terrorism has to be addressed rather than this or that specific component of terrorist actions. This holistic approach would also have to involve the participation of government agencies in conjunction with businesses and representatives of civil society, the media, and, indeed, the academic world. As a contribution to the scholarly study of terrorism and terrorism-related activities, Louise Shelley’s book presents an informed as well as eye-opening account of an important ongoing development in terrorism, one that will surely increase in significance in the near future. The turn towards a business approach in terrorism and the resulting dirty entanglements with other criminal ventures and with corruption, indeed, presents a peculiarly critical challenge to terrorism today and tomorrow. Contextual variables related to politics, demography, and environment must be expected to heighten this development as sectarian violence, population displacement, and economically impactful events related to climate change will create additional strains towards the elaboration of the connections of terrorism with crime and corruption. Author Shelley ultimately favors a financial and economic approach to stem the rise of the terrorism business. The suggestion makes sound sense from the viewpoint of her analysis, but it is also a logical outcome of the focus on the economics of terrorist activity. While there is no doubt great significance to this dimension of terrorism, it does not preclude a cultural approach as a complimentary model that can uncover the commitment to values associated with the conduct of terrorist groups. A more developed theoretical model to conceptualize terrorism as a sociological issue might have been suggested to point in that direction. But as an empirically grounded work situated in a public policy framework, Shelley’s book makes a very sound and welcome contribution to the analysis of contemporary terrorism. The issues that are at stake, as the author rightly notes, are nothing short of profound in potentially destabilizing political regimes and adversely affecting global health and the sustainability of the planet.